-Craig Lawson, Neil MacDonald and Brian Lowans, Gartner Market Guide for Cloud Access Security Brokers. Enterprise security requirements are increasing every day and so is the sophistication of cyberattacks. Multiple technologies need to come together to address these requirements while also relieving our customers of the need to research and integrate solutions together. 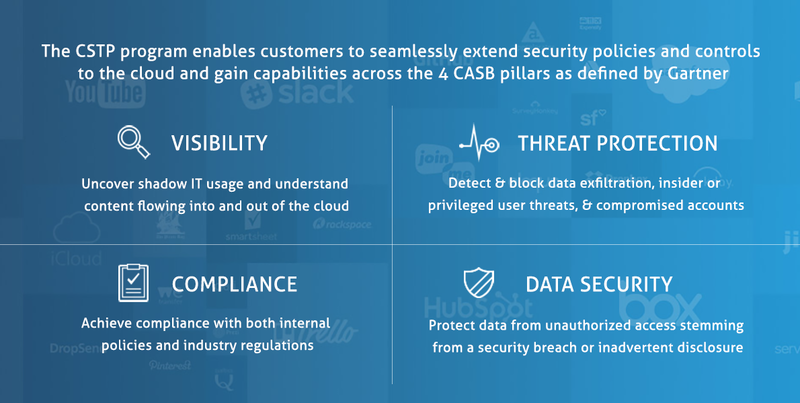 The CSTP program, designed based on customer feedback, brings together leading technologies to implement the best-in-class security solutions while enabling customers to maximize the value of their existing technology investments. Meet complex enterprise security requirements using multiple solutions quickly and efficiently. If solutions are integrated out of the box, customers don’t have to expend resources in integrating multiple components and testing them. They receive an integrated solution that has been tried and tested across several enterprises. Several customers already have comprehensive on-premises security components and workflows. As they look to expand this infrastructure to accommodate new trends such as cloud adoption, BYOD and third-party collaboration, they have more flexibility to select products that deliver security capabilities while leveraging already established technologies and workflows. Companies looking to deploy new security solutions often don’t have time to comprehensively evaluate different options and assess compatibility with their own IT systems. The CSTP program helps in informing these decisions by providing companies with thoroughly tested, certified and integrated solutions. The CSTP program provides customers with a collection of best practices, integration guides and joint references collected from across hundreds of deployments and enables them to increase their security expertise so they can better protect their systems and data as they move to the cloud and onboard new solutions. Join McAfee's partner program to expand your market opportunities, receive revenue sharing opportunities, collaborate on marketing programs, and more.